Modern amphibians, the Lissamphibia, are diverse, being represented by more than 4000 species that fall into four distinctive clades, the extinct albanerpeton-tids, the anurans (frogs and toads), the urodeles (newts and salamanders), and the gymnophionans (limbless caecilians). The history of each of these will be outlined briefly before a consideration of their origins and relationships. The albanerpetontids are a family of some five or six genera, known from the Mid-Jurassic to the Miocene of Europe, and most widely represented by Albanerpeton from North America (Gardner, 2001; McGowan, 2002). Celtedens, an early form, about 70 mm long, from the Upper Jurassic and Late Cretaceous of Europe (Figure 4.19(a,b)), looks just like a salamander, and it is no wonder that the albanerpetontids were long classified simply as salamanders. The body is long and flexible, the ribs are short, the tail tapers rapidly to a thin structure and the limbs are powerful. Key albanerpetontid characters are seen in the skull (Figure 4.19(b)): the frontals are fused together as one triangular element, and there is a prominent process pointing forwards and contact ing the premaxilla, nasal and lacrimal, and the articulation of the lower jaw and the skull is nearly vertical. In addition, the vertebrae of the neck are most unusual (Figure 4.19(b))—there are effectively only two of them, the atlas and axis, and these fuse directly with the first vertebra ofthe trunk. The reduction ofthe cervical vertebrae to almost nothing in albanerpetontids presumably stiffened the neck, and it may have been an adaptation for burrowing. of locomotion: the hindlimb is extremely long, with the addition of a flexible pelvis and elongate ankle bones giving it a'five-crank'hindlimb;the ilia run far forwards and the posterior vertebrae are fused into a rod called a urostyle, making a strong pelvic basket; the forelimbs and pectoral girdle are impact absorbers for when the frog lands; and there are no ribs and a short stiffened vertebral column with only four to nine vertebrae in the trunk. The head is short and flat, and the upper jaw is lined with small gripping teeth for processing insects or other prey. The specialized characters of the frog skeleton can be detected even in one of the earliest forms, Vieraella from the Lower Jurassic of South America (Figure 4.19(c)), which has elongate hindlimbs, reduced numbers of vertebrae, and a flattened skull. It is primitive in having more vertebrae than in most modern frogs (nine), small traces of ribs, and slightly heavier limb bones, but it offers few guides to ancestry. Prosalirus, another Early Jurassic frog, from the south-west USA (Jenkins and Shubin, 1998) has more elongate hindlimbs, and it was clearly the first jumping frog. Some of the 23 modern families of frogs may be traced back as far as the Jurassic or Cretaceous, but most have very short fossil records, or none at all (Estes and Reig, 1973; Sanchiz, 1998). 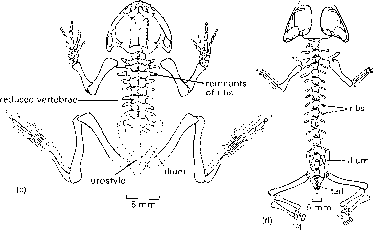 Triadobatrachus from the Lower Triassic of Madagascar (Figure 4.19(d)) is the oldest known frog: it has a reduced number of vertebrae, reduced ribs, elongate ilia and a frog-like skull. (Figure 4.20(b)) shows many changes; the bones are generally lighter, and the braincase has become fused with the parietal bones and is partially exposed on the skull roof. The teeth of salamanders bear two cusps (Figure 4.20(c)). The Gymnophiona, or caecilians, are strange little amphibians that look like earthworms (Figure 4.20(d)). They have lost their legs, hence an alternative name, apodans (literally 'no feet'), and they live by burrowing in leaf litter or soil, or swimming in ponds, in tropical parts of the world. The skull is solidly built, and can be used for burrowing by battering the soil with the snout (Figure 4.20(e)). There may be as many as 200 vertebrae in the trunk region, but the tail is generally short. The caecilian fossil record is meagre. For a long time, only isolated vertebrae had been reported from the Palaeocene of South America. The record was extended dramatically by the discovery of several Early Jurassic specimens in Arizona, USA, named Eocaecilia (Jenkins and Walsh, 1993). 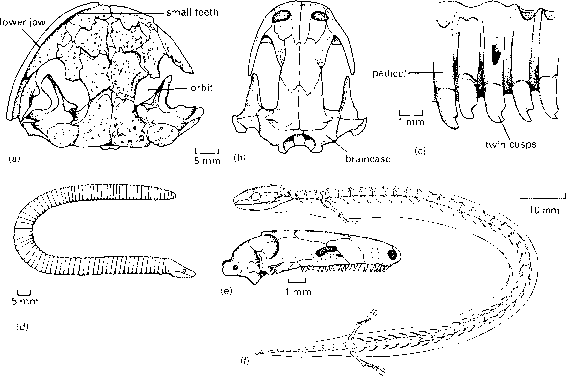 Eocaecilia (Figure 4.20(f)) shows typical caecilian features in the skull and its long body, but it has much reduced legs, confirming the origin of the group from limbed lissamphibian ancestors. 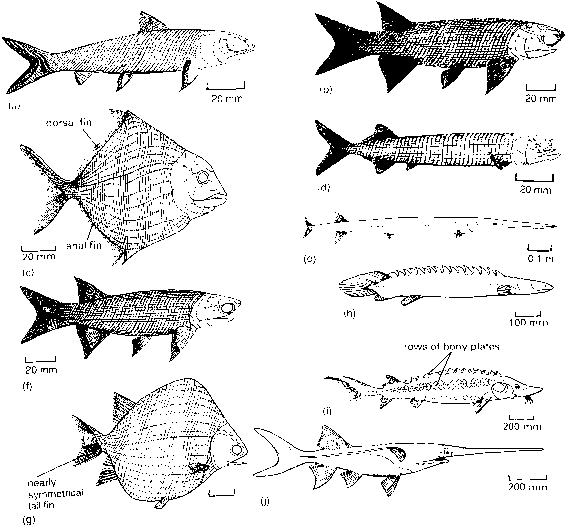 orders as having a separate origin among the lepospondyls (e.g. Carroll, 1987, 1998; Laurin, 1998; Anderson, 2001). Lepospondyls and lissamphibians do indeed share many features, but probably largely as a result of miniaturization and loss of elements. Relationships within Lissamphibia have been equally controversial. Generally, frogs and salamanders are paired as sister groups, together termed the Batra-chia, with gymnophionans as an outgroup (see Box 4.5). Hitherto, the albanerpetontids had been regarded as rather odd salamanders, but new studies (Gardner, 2001; McGowan, 2002) show they are probably an outgroup to the Batrachia, but the gymnophionans remain as a basal outgroup within Lissamphibia. Molecular results so far are limited. Feller and Hedges (1998) compared the DNA sequences of four mitochondrial genes, and found a sister-group relationship of salamanders and caecilians, with frogs as the outgroup. This contradicts the more usual pairing of frogs and salamanders. A study based on the complete mitochrondrial genome of a representative of each group (Zardoya and Meyer, 2001b), however, confirms the traditional Batrachia (frogs + salamanders) grouping. Fig. 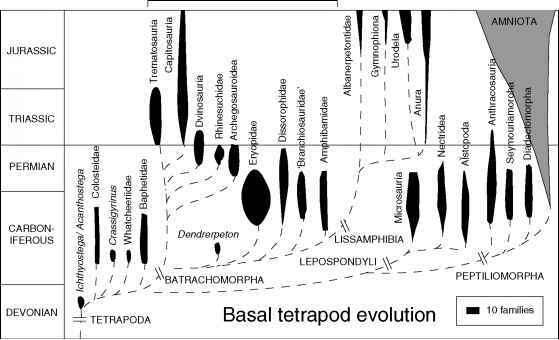 4.21 Evolutionary tree showing the major basal tetrapod groups, their known fossil records (vertical scales), postulated relationships (dashed lines; based on cladogram in Box 4.5), and relative diversity (width of'balloon'). but scattered fossils are known only in the Jurassic and Cretaceous, before a major expansion in the Cenozoic.